> DVD Suwari-waza Kokyuho, Ryote-dori. Basic Practice Methods. The last DVD of Basic Practice Methods. 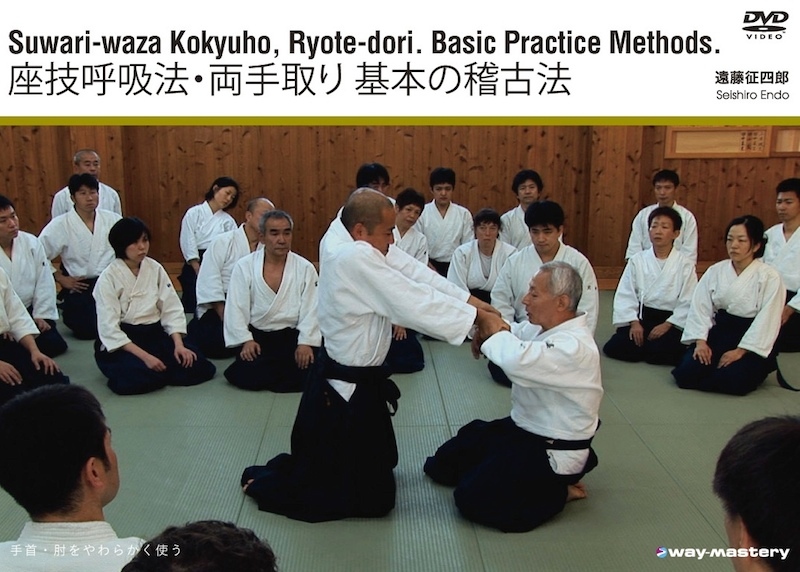 The first sections of this DVD cover various aspects of suwari-waza kokyuho, as practiced in specified ways, such that the viewer may draw some crucial connections between the practice of suwari-waza kokyuho and other ryote-dori practice. Later sections cover some of the basic forms, all the while with general explanations of how to use one's body and feeling, advice, and invitations for reflection, and specific technical details. Subtitles in English throughout, as well as tags corresponding to sections in the other DVDs. The featured seminars for this DVD were the 15th and 16th Aikido Saku Dojo Yudansha Seminars of 2009 and 2010.